Our mission of only offering pearls of uncompromising quality means going to the source for the world’s best. That’s why most of our pearls come from our partner pearl farm located on the idyllic atoll of Fakarava in the Tuamotu Archipelago. A UNESCO protected biosphere, the pristine nature of this lagoon gives life to the living beauty of our Tahitian pearls. Using state-of-the-art techniques in these ideal conditions, our team of six professional grafters seed more than 300,000 pearls each year. With great care, attention to detail and a rigorous selection process, our pearl farm is then able to produce 120,000 of the world’s finest quality Tahitian pearls for use in our extraordinary collection of fine jewelry designs. The Fakarava Pearl Farm extends over an area of 235 acres and its prime location makes it ideal for the cultivation of the finest Tahitian pearls. Situated in an isolated lagoon with limited access from north and south, the farm benefits from a continuous supply of nutrient-rich fresh water. These extremely rare conditions create a nearly perfect environment for cultivating pearls of the finest quality, consistency and luster. Created in the crystalline waters of French Polynesia, Tahitian pearls are so imbued with a sense of place their very form transports you there. Their lustrous surface reflects the shimmer of distant lagoons while a pearl’s sublime curves suggest mythic sensuality and passion. The South Seas also impart to them a variety of hues and shapes seemingly dreamed from an artist’s palette. Yet they are as real as the hand that holds them. And as anyone who has worn one will tell you, they enchant and captivate all who behold them. Tahitian pearls are known the world over for their unique shapes. While round pearls have long been popular, six additional shapes are now available to capture the imaginations of designers and customers alike. Semi-round, oval or button, ringed, semi-Baroque and Baroque shapes are all expressions of the pearl’s natural beauty that inspire designers to create ever more magnificent jewelry. Tahitian pearls display an infinite palette of natural colors – from white and cream to bursts of vibrant shades including cherry, peacock, green, blue and gray culminating in the dramatic statement of mystical black. Whatever your hues inspire you, there is a lustrous Tahitian pearl waiting to adorn you. Commonly called black pearl, the Pearl of Tahiti offers a much wider range of colors. Rare pearl not to be tinted by man but by nature, it comes in an infinite palette of shades that, like the lagoons of Polynesia, is unique in the world: cherry, cream, peacock feather, green , blue, gray, white … For this criterion, the choice is above all a story of taste. Tahitian cultured pearls are perfect creations of nature, each with a singular set of color, shape and surface characteristics that contribute to its unforgettable cachet. Once in a great while, a true rarity is discovered – a pearl with a surface so perfect, it is elevated to a superstar status for its exquisite beauty. 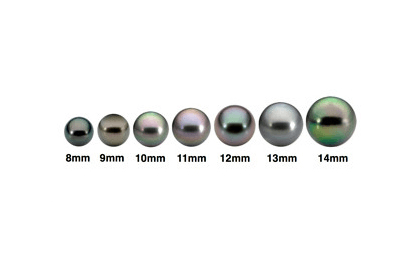 Tahitian pearls are classified according to the quality of their surface (regardless of shape and size) using a scale from A to D: Class A pearls have tiny surface imperfections limited to less than 10% of its total surface area; Class B less than a third; Class C less than two-thirds and Class D more than two-thirds. *The vast majority of Tahia Exquisite Tahitian Pearl jewelry is created using grade A and B pearls. While size does not affect the quality of cultured pearls, it does affect the price. Large pearls are more difficult to cultivate and their rarity makes them more valuable. 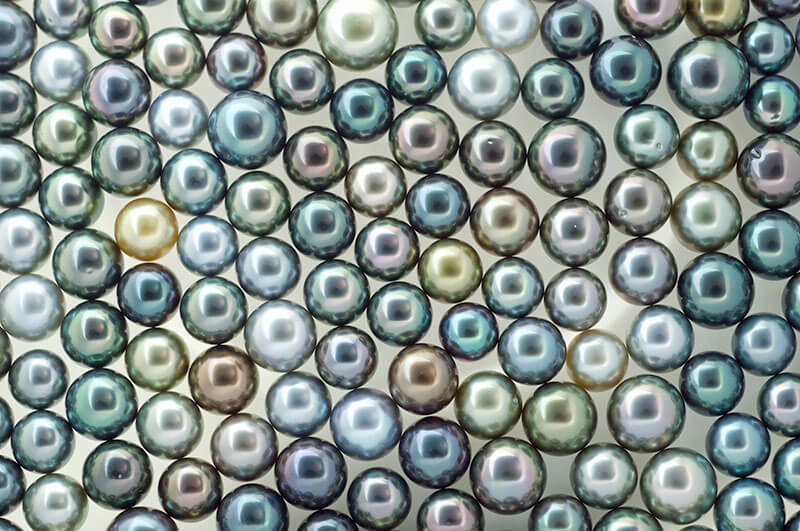 Pearls are measured in diameter increments of millimeters (mm). Tahitian cultured pearls begin at 8mm and can grow as large as 18mm. Our pearl designers and craftsman are highly skilled in the refined art of marrying just the right size and shape of pearl with a jewelry setting that beautifully showcases all its natural attributes. Prepare to swoon. Tahitian cultured pearls are that rare phenomenon that represent a unique harmony between man and nature working in complete synchronicity. 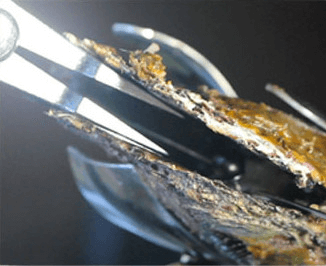 They grow within a very specific type of oyster: pinctada margaritifera var. cumingii, prized for its rarity and the beauty of its internal surfaces. The exotic name ‘magaritirfera’ is taken from “margarita” the Latin word for pearl. In French Polynesia, The pearl-bearing oysters are referred to as ‘nacres” (mother-of-pearl) a name derived from the Persian word ‘nakkar’ which means iridescent or sparkling ornament. With the magnificent pinctada margaritifera as a host, the process of pearl farming or pearl culturing has two phases: nacriculture (the cultivation of pearl-bearing oysters) and grafting. Nacriculture , or the cultivation of the pearl-bearing oysters, begins during the warmer months between November and April. 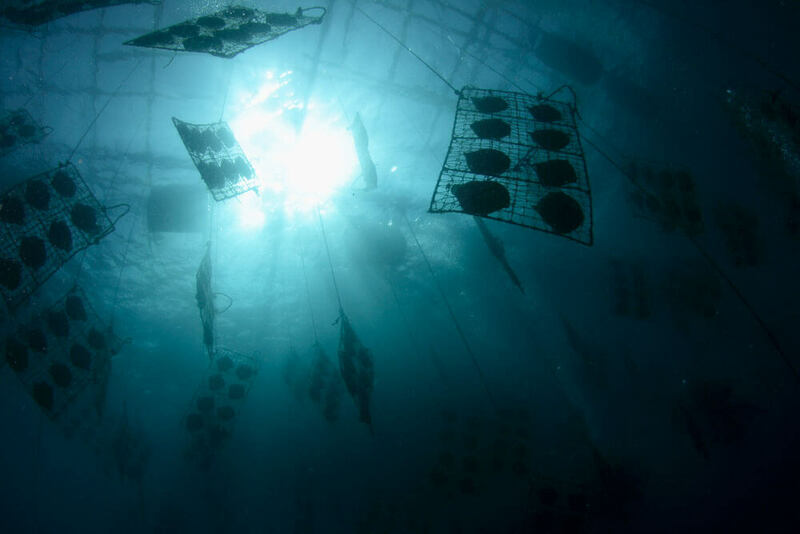 Pearl farmers set up “collectors,” also called “parasols,” strips of cloth that look like awnings hanging from a network of ropes across the lagoon. A “station” is a rope on which the collectors are fixed at regular intervals. The collectors are used to capture the planktonic larvae which have come from the reproduction of the parent mollusks in the natural surroundings of the lagoon. Environmental conditions must be ideal for collecting to be effective. Since collecting is not possible in all lagoons, pinctada margaritifera oysters found in less productive areas are often transferred from their original locations to the atolls where successful cultivation is more likely.